Goldfish need different foods at different stages of their lives. Baby goldfish, called fry, go through several phases of development before they look like adult fish. Each phase requires different foods and different types of care. Goldfish take about a year to reach maturity, though they may change somewhat after that. When a goldfish fry first hatches, it can live off its yolk sac for about 48 to 72 hours. During this time, do not feed the baby fish. Any food will go to waste and rot, polluting the water and potentially harming the baby fish. At this point, care should be taken to remove any infertile eggs, as they will also rot and foul the water. 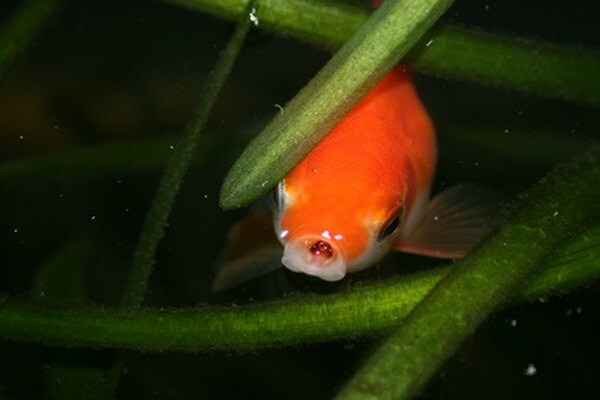 About 20 percent of goldfish eggs will be infertile, and can be recognized by a cloudy color. Once those first few days have passed, goldfish will be between 1/8th and 1/16th of an inch long. They will need food. A paste of hard-boiled egg and oatmeal will suffice. Attention to cleanliness is key; any uneaten food should be siphoned out after twenty minutes. Uneaten food can decay and impact water quality. Developing goldfish are much more vulnerable to bad water than adult fish. You can also use prepared baby fish foods if your pet store stocks them. Feed them three times a day. At one month old, baby goldfish can eat regular fish food, ground up for their size. At four months, they no longer require ground-up food. Again, you want to siphon out anything they haven't eaten after the first 20 minutes to keep from polluting the water. They are still vulnerable to poor water quality. At one year, they reach sexual maturity, and are basically adult fish. They can breed at this point. While goldfish are sexually mature at one year old, they may take up to two years to develop their "adult" coloration. Often, goldfish fry start out a brownish silver color and only later develop into their trademark gold color. Some drabber goldfish retain this darker silver coloration. At the same time, some fancy varieties develop their coloration more quickly than common goldfish. These fish are also able to breed at a somewhat younger age than common goldfish.